Years later, I [J.B. Priestley] often asked myself why I had joined the Army. The usual explanations were no good. I was not hot with patriotic feeling; I did not believe that Britain was in any real danger. I was sorry for “gallant little Belgium” but did not feel that she was waiting for me to rescue her.The legend of Kitchener, who pointed at us from every hoarding, had never captured me. I was not under any pressure from public opinion, which had not got to work on young men as early as that; the white feathers came later. I was not carried to the recruiting office in a herd rush of chums, nobody thinking, everybody half-plastered; I went alone. (Most of my friends joined elsewhere and later, when the local ‘Pals’ Battalion’ was formed—and in July 1916, on the Somme, that battalion might have been dry moorland grass to which somebody put a match.) I was not simply swapping jobs; though the office bored me, life in the Army certainly did not attract me, and for some years I had regarded with contempt those lads who wanted to wear a uniform and be marched about. This was no escape to freedom and independence; I may not have known much about military life; but I was not so green. And I certainly did not see myself as a hero, whose true stature would be revealed by war; that had never been one of my illusions. What is left then to supply a motive? Nothing, I believe now, that was rational and conscious. Remember that for months before, as I have already suggested, though enjoying myself, perhaps almost feverishly, I had come to a standstill, refusing to make any plan, even to consider the future, really because in that other time scale of the unconscious my world had already ended. I was kept from making any move by some mysterious prompting from the dark of my mind. And now, prompted again, there was a move I had to make. I went at a signal from the unknown. […] There came, out of the unclouded blue of that summer, a challenge that was almost like a conscription of the spirit, little to do really with King and Country and flag-waving and hip-hip-hurrah a challenge to what we felt was our untested manhood. Other men, who had not lived as easily as we had, had drilled and marched and borne arms—couldn’t we? Yes, we too could leave home and soft beds and the girls to soldier for a spell, if there was some excuse for it, something at least to be defended. And here it was (MR 81-82). He started at Frensham Camp, near Farnham, with training. “We slept twelve to a bell-tent, kneeling after Lights Out to piss in our boots and then emptying them under the flap. The old soldiers told us that this was good for our boots, making them easier for route marches” (MR 90). There were no rifles to practice with. 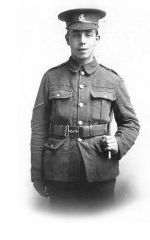 From Frensham he went to Aldershot, and then to Folkestone in February 1915. He did some work in the officers’ mess. To this day, if need be, I can wash up and dry as fast as anybody I know; but other skills I learnt then—for example, I could toast eight slices of bread at the same time, using four toasting forks—have decayed through lack of use. We lived well in the kitchen, the staff looking after its own; many a time I saw a fin e portion of some specially good dish set aside for me when I could hear in the distance the waiters telling belated officers in the dining-room that that dish was “off” (PW 37). Then he was transferred to Maidstone, to dig defences for London, and then to Branshott Camp in Hampshire. August 2nd! And still in England! How the time passes on. It strikes me that they will need a great many more men in France shortly, so perhaps we shall go there. I hope so. The men here are getting thoroughly dissatisfied at being kept so long […] (PW 43). Finally, at the end of August 1915, he went to France. While aware of unpleasant physical sensations, I felt at heart detached from them, moving—as I wrote in my first letter home—almost floating, in a long dream. I suspect that this feeling, that here was no reality, never from this time entirely left me, out at the Front or back at home, until the day I was demobilised, nearly four years later (MR 99). The truth is, as anybody can discover from the behaviour of very young children, terror arrives first through the ear… As time went on the vast cannonading, drumming hell into your ears, no matter whether it was their guns or yours, began to wear you down, making you feel that flesh and blood had no place in this factory of destruction. So in that war it was not the recruit but the veteran who began to feel that he was being hammered into the ground. […] In that listening post I was the gallant Tommy of the home-front legends; but as time wore on I was more and more a chap who wondered what the hell he was doing there and how the hell he could get out of it — a mouse in a giant mincing machine (MR 100). Worse then than the raids, worse than the German heavy batteries that occasionally got our range and dropped “Jack Johnsons” among us, were the mere conditions of existence in the front line and communications trenches, now with winter upon us, that were mud and water. For days and days on end, wearing six pairs of socks and high gum-boots and a sheepskin jacket that was either wet or caked in mud, I slithered around, trying to sleep on the trench firestep or crawling into some hole in the wet clay, filthy and maddeningly loud, never seeing anything like hot food (MR 101-102). I wonder how many men still alive remember being in that support trench that ran through a French village cemetery. There we had great crosses and monuments of granite and marble all round us, unbelievable at night when the darkness was split by the white glare of Véry lights and the shadows were gigantically grotesque, though often we had no time to notice them, having to duck down as machine-gun bullets ricocheted off the funeral stones. I cannot remember now whether it was before or after I knew this Edgar Allan Poe setting that I was whisked away for a week or so to do some clerking at Third Corps headquarters (MR 103). He was wounded once, lightly, in the hand by a rifle grenade; he recovered in France. And then, on 1 June 1916, a bomb landed in his trench, two or three yards away. All I knew at the time was that the world blew up” (PW 68). He was buried alive for a while, leaving him with a lifelong claustrophobia (he avoided the London Underground as much as he could). He was taken to the military hospital at North Evington, near Leicester, and then transferred to a country house in Rutland for his convalescence; he used to bang away at an old piano to amuse himself, and his fellow patients. From there we went to a convalescent camp in Ripon: “There I was miserable, like everyone else I knew” (PW 72). He spent a large part of 1917 convalescing. “I was lucky. I might have been at Passchendaele, where Haig, who ought to have gone there himself or gone home, was slicing my whole generation into sausage meat held above a swill bucket” (MR 121). On his return to the front in France in the summer of 1918 he was apparently poisoned by gas, even though he was wearing a gas-mask. He was picked up by stretcher bearers. “So much for my last glimpse of action in the Great War” (MR 126). Later he was in charge of moving enemy POWs. The British Army never saw itself as a citizens’ army. It behaved as if a small gentlemanly officer class still had to make soldiers out of under-gardener’s runaway sons and slum lads known to the police. These fellows had to be kept up to scratch. Let ‘em get slack, they’d soon be a rabble again. So where the Germans and French would hold a bad front line with the minimum of men, allowing the majority to get some rest, the British command would pack men into rotten trenches, start something to keep up their morale, pile up casualties and drive the survivors to despair. This was done not to win a battle, not even to gain a few yards of ground, but simply because it was supposed to be the thing to do. All the armies in that idiot war shovelled divisions into attacks, often as bone-headed as ours were, just as if healthy young men had begun to seem hateful in the sight of Europe, but the British command specialised in throwing men away for nothing. The traditions of an officer class, defying both imagination and common sense, killed most of my friends as surely as if those cavalry officers had come out of the châteaux with polo mallets and beaten their brains out. Call this class prejudice if you like, so long as you remember, as I hope I made plain in an earlier chapter, that I went into that war without any such prejudice, free of any class feeling, No doubt I came out of it with a chip on my shoulder; a big, heavy chip, probably some friend’s thigh-bone (MR 136-137). Unlike most of my contemporaries who wrote so well about the war, I was deeply divided between the tragedy and comedy of it. I was as much aware as they were, and as other people born later can never be, of its tragic aspect. I felt, as indeed I still feel today and must go on feeling until I die, the open wound, never to be healed, of my generation’s fate, the best sorted out and then slaughtered, not by hard necessity but mainly by huge murderous public folly. On the other hand, military life itself, the whole Army “carry-on”, as we used to say, observed closely, seemed to me essentially comic, the most expensive farce ever contrived. To a man of my temperament it was almost slapstick, so much gigantically solemn, dressed-up, bemedalled, custard-pie work, but with tragedy, death, the deep unhealing wound, there in the middle of it (MR 139). One morning in the early spring of 1919 in some town, strangely chosen in the Midlands, I came blinking out at last into civilian daylight . […] Glad to remember that never again would anybody tell me to carry on, I shrugged the shoulders of a civvy coat that was a bad fit, and carried on (MR 140). This information comes from either J.B. Priestley, Margin Released: A Writer’s Reminiscences and Reflections (London: Heinemann, 1962) (= MR) or Neil Hanson, with Tom Priestley, ed., Priestley’s Wars (Ilkley: Great Northern, 2008) (=PW).